I don’t suppose I shall ever get to Lincoln! Perhaps trial samples of products could be sent mail order? That’s a real shame – I’d heard a few stories in the past about their finances being a bit bumpy. Staff were always really nice. Doesn’t bode well for the introduction of parking charges on Old Dover Road, either. If anyone (like me) is stuck for a place to get Ecover refills, the nearest outlet is at Sheel Pharmacy on Lewisham High Street, opposite Ladywell Leisure Centre. My worry too but Ecover refills can thankfully be purchased at the whole food shop in Greenwich market. Ah, thanks Laura, that’s good to hear – the last time I tried the Whole Food shop, about a year ago, they told me they didn’t do them. The wholefood shop in Greenwich Market does BioD refills, rather than Ecover. Just as good, but different. The damage to our shopping centres (particularly Eltham and the Old Dover Road where there are Conservative Councillors) from the introduction of parking charges is one I have been highlighting consistently since the Cabinet voted to introduce them. We did propose an alternative source of funding to stop the Council having to introduce the parking charges at Council last night, but Labour rejected it. Future funding from government will be based on Business Rates, so the effect of shops closing will also reduce the amount of grant the Council receives from central government. Council collects on their behalf. Whilst I did know that I still feel frustrated by a lack of understanding of what we in the Town Centre are going through and your last paragraph is very interesting. Thanks for bringing up the subject of parking rates! This is very sad news indeed. As a very frequent customer to the store I am bitterly disappointed. In 2 years Old Dover Road Shops will all be Chicken Take Outs, Bookies & Charity Shops…….hang on, isn’t it like that now? It’s not, though, is it? One charity shop, yes, one fish’n’chip shop that also does chicken; and no bookies. That’s an interesting view – my perception is that the Standard’s not doing too badly, considering the general economic environment. I don’t think there are any more empty shops than there were, say, 4 or 5 years ago; some new businesses have opened and seem to be doing ok; existing businesses that seemed to be strufggling 18 mths ago seem to have picked up again. I’m genuinely interested to know in what way you think it’s going downhill. This is very sad news and another nail in the coffin for the town centre. So Organic added a touch of kudos along with a few other independent businesses who strive hard to make things work for Greenwich. Although we have to take responsibility for our businesses there are other contributing factors that are causing this decline, things that are out of our control. I therefore do not think it fair to comment openly on ‘stories from the past’ about finances being ‘bumpy’. This is not a helpful remark though I appreciate we all have an opinion. The Council does not seem to understand how hard things are for small independent businesses. Neither do they seem to understand the spirit of enterprise and how important we are to the Town Centre. I am very sad that the independent and unique fabric of our lovely town is being eroded. I used to work on community magazine, The Guide and spoke to local business owners everyday. I also live in, and love Greenwich but I know full well the spirit of Independants is being crushed. The new chain restaurants blighting the college by the river say it better than I ever could. Greenwich is seriously in danger of losing it’s USP and it’s discerning shoppers. We here at STRINGER are very sorry to see SO ORGANIC close. We are the company that made their ‘beautiful shop’. We wish Samantha and Stuart best of luck for the future. Conditions for independent retailers are unbelievably hard right now – the Mary Portas report is very illuminating on this complicated subject. Thank you for all the kind comments form everyone. Just to clear up one small point, finances were not an issue, and So Organic is reopening in Lincoln in mid June. It was purely a decision on trading conditions, both current and future, in Greenwich itself. Footfall is down now, and with the demolition of Greenwich market next year for 18-24 months, the outlook isn;t good. We had a wonderful group of customers, and the decision was heart breaking. We are sorry to be going. So Organic is still online, selling all the products that were in store, and if anyone is visitng Lincoln in the future, do look out for the So Organic store in the historic Cathedral quarter, looking as beautiful as ever thanks to our friends at Stringers….shop fit just temporarily off line! WEll I for one am very very sad to see the So Organic close, with the onset of spring approaching ventured into greenwhich (on foot through the park) deliberately leaving the car at home, excersise and no parking fees being the motive. With the intention of going to So Organic to browse and hopefully purchase some bits. Was heartbroken to see it closed and seems only fitting to say so on this forum. As others have said it added much needed additions to greenwhich, it is sad when independent retailers go. Good luck all and may see you on line, though its just not the same without the knowlegeable and friendly staff to give advice. Best of luck to Samantha and Stuart on the opening on the Lincoln So Organic. I have no doubts it will do well. I loved the treatments rooms at So Organic the staff were lovely and the treatments with the Organic products so much nicer than the more aggresive products used at other salons. Is there any way to find out if any of the salon staff have relocated to other places nearby or have set up on their own to continue beauty treatments? Great news! I bumped into one of the beauticians today and she told me that most of the salon staff are now working about half hour away. She gave me their card, the new number is 01322 279 699. I’m so pleased it’s all working out for them too. Sorry to sound so pessimistic but a half an hour is still a long way from the heart of Greenwich and I do not have to time to go that far (I think the prefix 01322 is Dartford or Erith but please correct me if I am wrong). 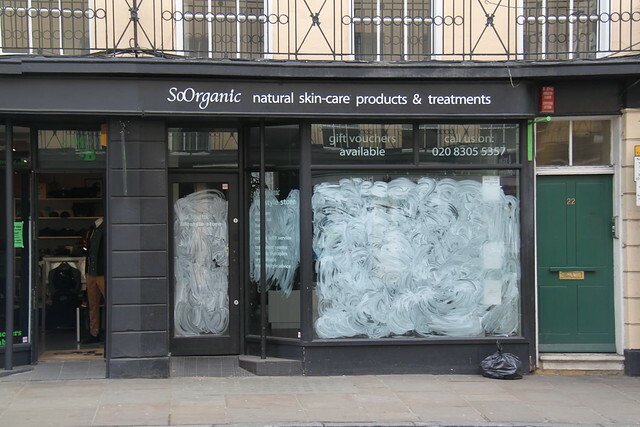 Greenwich Town Centre has lost a good beauty salon with good products However, I am glad to hear that these competent and professional staff have been able to find a new location. Rasana was my therapist at So Organic, I called them up and she’s working there now (Thank you so much Rachel)! Had my appointment today and it was well worth the extra drive. Haha and it’s a lot closer than Lincoln!